Era Tognoli, who ran Asbury Park's own Metro Lyric Opera for 50 years, died last week as a result of a stroke. Read Michelle Gladden's articles from yesterday and today at the Asbury Park Press online. I reviewed and previewed many of Metro Lyric's events and interviewed Tognoli in person twice. She was a wonderful person, a charmer and a manipulator extraordinaire. One of the area's great characters. 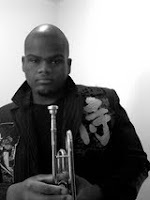 Tonight 7:30-10:30 p.m. the New Jersey Jazz Project hosts Curtis Taylor and SKOPE at the Makeda, 338 George St., New Brunswick. The ensemble consists of Curtis Taylor, trumpet, Seth Johnson, guitar, Corcoran Holt, bass, Nate Jolley, drums and special guests TBA. Taylor just got his Master's in Music from Rutgers in 2009, but he's been on the national scene for a few years prior to that, appearing on NPR with pianist Cyrus Chestnut and performing as part of the James Carter Quintet. Leading his own ensemble, his music has an unstoppable, percolating rhythmic verve that excites all his phrasing. His solos are thoughtful and surprising and his band is first-rate. By way of example, check out some of the recordings posted on his website.